I love Central Park, in New York City; and I love that despite growing up in the age of horror stories about Central Park, I now very much feel like it is one of those wonderful places in the world, that I own, at least, just a bit. The first time, I went exploring the park alone, was when Kate was in the city on business and I had the privilege of partaking in one of my most favorite activities in the world – walking city streets! On a recent trip, the city and park gave me a first, at least as an adult; I cannot honestly say I remember this moment, as a child, when we lived in the Bronx, but my parents were those wonderful kinds of parents that tried to avail their children of any and all experiences, so it is possible I have seen this before. However, on this particular overcast day, a bit more chilly than I would have liked, I hit the park and happened upon the zoo, at exactly the right moment. I came upon the Delacorte musical clock, as it got ready to thrill us all! What a treat; it reminded me of the Prague Astronomical Clock; I loved how excited people were to stop and watch the moving animals and listen to the chiming music. Tis the season for wonder – enjoy! “Delacorte, whose many gifts to the City of New York include the Alice in Wonderland statue (1959) and the Delacorte Theater (1962) in Central Park as well as fountains in Bowling Green Park (1977) and Columbus Circle (1965), conceived of the clock as a modern version of belfries in churches and city halls dating back to the Middle Ages. 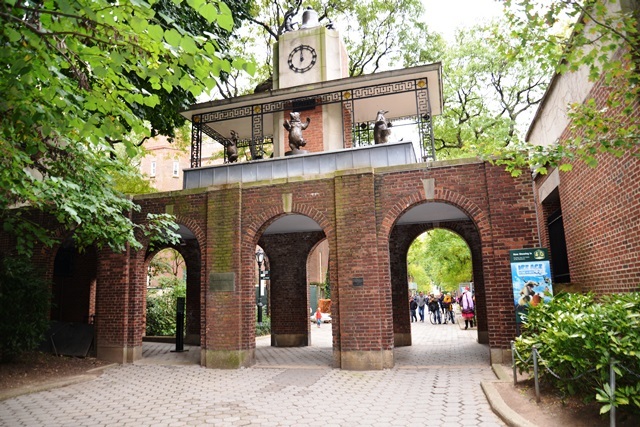 Designer Fernando Texidor collaborated with architect Edward Coe Embury (son of the 1934 zoo’s designer, Aymar Embury II) to create a brick arcaded bridge between the Monkey House (now the Zoo School) and the main Central Park Zoo quadrangle to house the clock and its animal sculpture carousel. Italian sculptor Andrea Spadini (1912–1983) crafted the whimsical bronze sculptures, which depict a penguin, kangaroo, bear, elephant, goat, and hippo parading with a variety of musical instruments as well as two monkeys with mallets that strike the bell. This entry was posted on November 24, 2018 at 4:24 pm and is filed under A View from the Road, SlideShow. You can follow any responses to this entry through the RSS 2.0 feed.